Max arrived at the usual time wearing his usual smile. We were looking forward to spending a great day together. We had decided we would visit Bridgend, not a place noted for its visitor attractions, but I had worked out we could go to Bridgend via Cardiff and Llanharan and Pencoed and return by the direct route through the Vale of Glamorgan via Llantwit Major and Rhoose. I have never travelled via Llanharan before and I thought that would be rather exciting! After breakfast, we began the day listening to the new Scallywags CD. It’s great – full of nursery rhymes and Bethesda songs. Max particularly likes Twinkle, Twinkle Little Star and a song about a Dingle Dangle Scarecrow… He enjoyed me doing all the actions anyway! We had fun. However after our impromptu singalong , circumstances made necessary for us to change plans. Firstly, I was asked to meet some local councillors to show them around Bethesda as the Library is moving in during some forthcoming renovations and secondly, I was sent on an errand to buy 14 cot sheets and blankets and other bits for our local Christian Conference Centre. The Lady of the house had issued the instructions and I thought it wise to keep her sweet – always a wise thing to do. Annoyingly, the councillors had come and gone before I arrived, so we just made our way to our local Asda to purchase the required bedding items. I wasn’t sure how good Max is in a supermarket, but I needn’t have worried – he was fab. I played my usual trick of sitting Max in the trolley and pushed him, so he was looking forward. After all trailing around Asda looking at me is not good for anyone’s health! We checked in with Asda’s new self-scanning checkout tool. Max loved it and I can tell you that the little hand sets are almost indestructible, as Max launched ours several times and set it crashing across two aisles without any apparent damage at all and it still managed to keep a record of all we had bought! We bought all we had to, picked up a few after school snacks for Max’s brother and cousins and made our way out. A visit to Penarth was next on our agenda after the disappointment of the Bridgend trip. 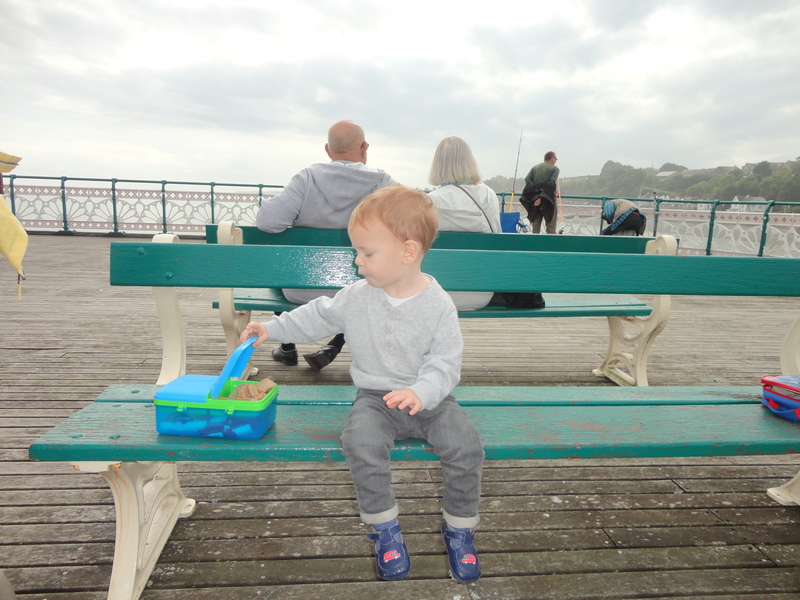 Penarth is a seaside town full of charm and character just across the water from Cardiff bay. Penarth’s Victorian and Edwardian founders created an elegant resort with fine public buildings and ornate houses. Its restored art-deco pier, complete with art gallery and cinema is a popular spot for a stroll and port of call for the Balmoral Paddle Steamer. Penarth boasts a number of splendid parks that link the seafront to the quirky independent shops in the tree-lined centre. Techniquest, Cardiff Glass, Cardiff Bay and the Cardiff Bay Barrage. Only two are in Penarth… Cosmeston Park and Lakes and Penarth Pier! We were heading for the Pier. Number 5 on the list. Parking was a nightmare and I circled the Esplanade three times before finding a parking space. Eventually, we set off from the car and Max loved it. Max always enjoys a ride in the pushchair and happily swings his legs and takes an interest in all he sees. As we approached the pier we saw an important looking ship being escorted into Cardiff Docks. 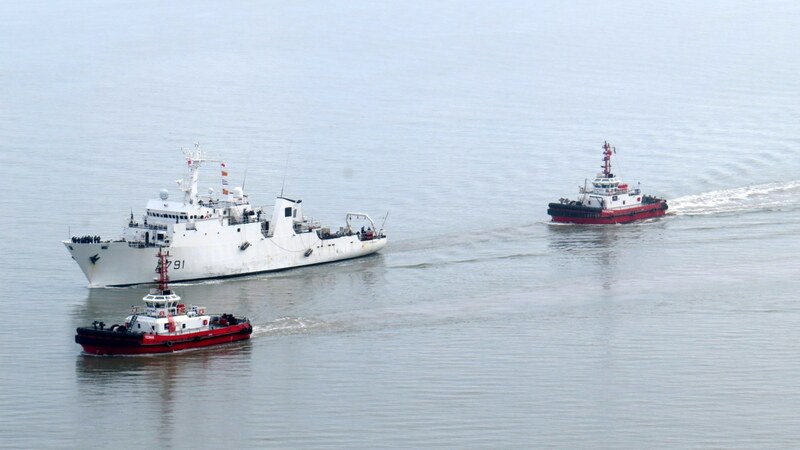 In what looked at first glance like a last desperate throw of the dice to dissuade we Welsh from leaving the EU – today the French Navy put on a show of force and sent in their warships to pay Pays de Galles a little “goodwill” visit. It’s understood the French are still a little bit sensitive not only about their defeats at Trafalgar and Waterloo – but also about the outcome of the Six Nations last March when Wales beat France by 14 points to 13. This ship however was coming in peace! As naval custom and tradition dictate, the crew lined up at the bow to signify they had no hostile intent – at least on this particular visit. This occasion is all about hospitality. French hostility – no doubt – is being left for the Brexit negotiations. Meanwhile the French sailors were evidently looking forward to spending “Le Weekend” in Cardiff to indulge in whatever the French for “entente cordiale” is. 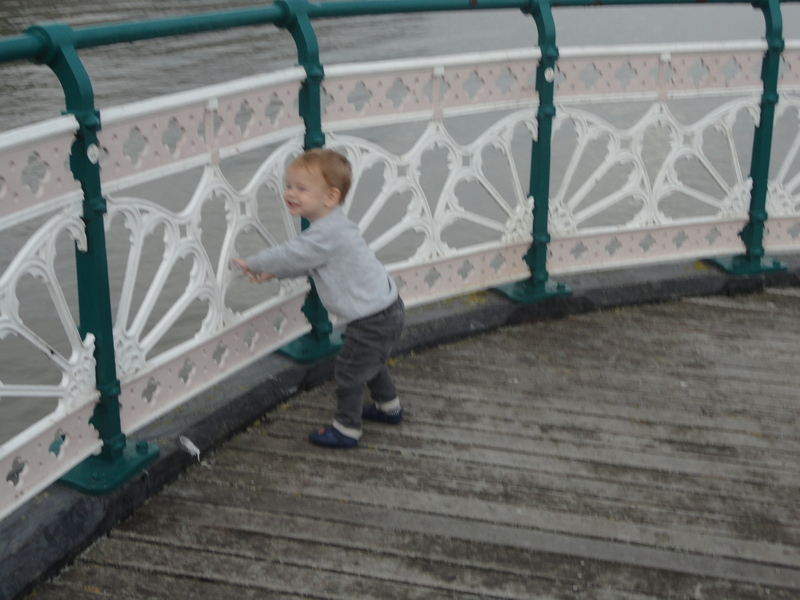 Max loved the pier, investigating every part and enjoying the views. We decided to have lunch on the pier and I made a fatal mistake. Whenever I visit Penarth I usually end up meeting ex pupils from Cogan or sometimes ex parents. On the journey to the pier we had met nobody, and Max looked so smart. I worried that if Max made a mess of eating his lunch we would probably meet someone on the way back. Well the worst happened; I allowed Max to start with his yoghurt which he now likes to eat on his own. His first large mouthful missed his mouth completely and landed squarely on the front of his cardigan. I fumbled about in the bag searching out the wet wipes while at the same time trying to prevent Max’s second mouthful. Disaster… the wet wipes were in the car. I just had to rub the yoghurt into his cardigan and lick the yoghurt off his finger. I knew straight away that would certainly mean I would meet an ex-parent on the way back to the car. After a lovely time on the pier we headed to the beach. There was one other lady with a small child seating near the water line, so we strolled further along till we found a deserted part of the beach and headed down the steps and across the pebbles. Max asked me to carry him as he was unsure of his footing! When we reached the water the tide was coming in and we had to keep edging back. I could believe how high the water rises here, as when the tide is high the water can be quite near the top of the sea wall. That’s amazing. I must bring Max back here for him to see it. The little lad couldn’t believe it when I encouraged him to throw some small pebbles into the sea. Max absolutely LOVES to throw things… most things actually, toys, ornaments, food (especially food) and usually gets a ticking off! Now here was his grampy encouraging him to throw stones. Max thought was in heaven and had such a great time. 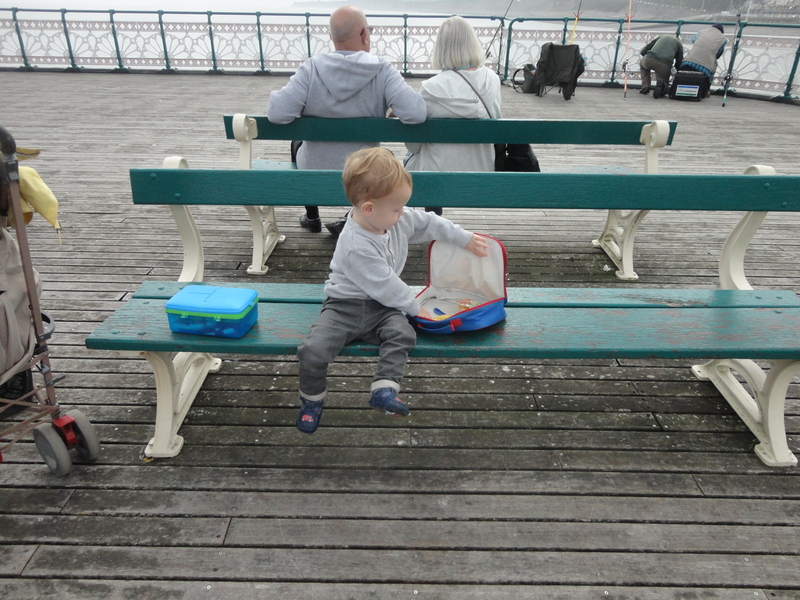 He always went for the biggest stones he could find – that’s my boy… think big!! ” Hello Mr Newberry, you probably don’t remember us…” But I did of course – they were some old Cogan parents, pushing the daughter of the pupil I used to teach as a seven-year-old in the 1980s. It’s amazing how many Cogan people I can still remember and yet some children I taught recently I find easy to forget their names. Max, with his yogurt stained and bedraggled clothes, was proudly presented to the Fentons and gave them one of his very best smiles. I couldn’t have been more proud to show off my little friend – we had had such a great time and his messy clothes were a great reminder of that. We made our way back home and prepared the after-school snacks for Max’s brother and cousins. Having all of them around after school was the perfect end to a truly lovely day! It was another lovely day, Just Max and me… friends together.